South Korea's Vice Defense Minister Suh Choo-suk called for Britain's support for Seoul's efforts to foster a lasting peace on the peninsula during his talks with a top British military official on Tuesday, Seoul's defense ministry said. 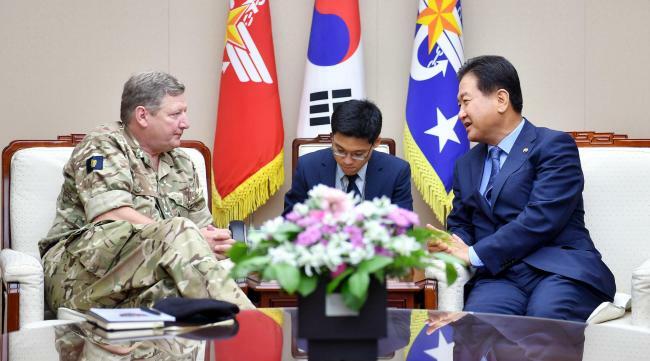 Suh held talks with Gen. Christopher Deverell, the chief of the United Kingdom's Joint Forces Command, who came to Seoul on Sunday for a four-day visit aimed at strengthening bilateral defense cooperation. "(Suh) said that there need to be unified efforts by the international community to induce North Korea to give up its nuclear program and continue to engage in the dialogue process," the ministry said in a press release. "To this end, he called for close cooperation and support from the international community, including Britain," it added. In response, Deverell pledged to make active efforts for the complete denuclearization of the peninsula and the establishment of a lasting peace regime, the ministry said.